Status: Active 2003-on. Born: 1970-12-28. Spaceflights: 2 . Total time in space: 365.96 days. Birth Place: Riga. Graduated from the Tallinn Polytechnic School in 1990. Graduated from Bauman Technical University in 1998. Two years of service with the Red Army in Vilnius. Civilian test engineer, RKK Energia from 1998. Cosmonaut from 2003-05-29. Cosmonaut training 16 June 2003 - 28 June 2005. PERSONAL DATA: Born December 28, 1970, in Riga, Latvia. EDUCATION: In 1990 graduated from the Tallinn Polytechnic Institute. In 1998 graduated from the Moscow Bauman Technical University with a degree in low temperature physics and technology. EXPERIENCE: In 1990 - 1991 he served in the Soviet Army in Vilnius, Lithuanian Soviet Socialist Republic (presently Lithuanian Republic). Since 1998 till 2011 worked at the Energia Rocket Space Corporation. COSMONAUT SELECTION DATE AND CLASS: In January 2003 successfully passed technical examinations at the Energia Rocket Space Corporation. On May 29, 2003, the Interdepartmental Board assigned him to the GCTC Cosmonaut Corps for basic training. 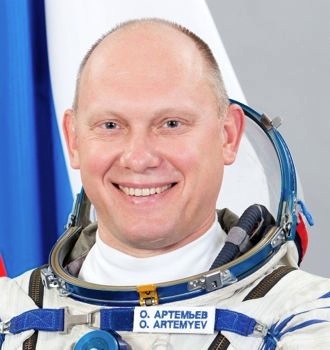 On June 16, 2003, he started basic training for spaceflight and completed the training course on June 28, 2005, by passing state examinations at the GCTC with excellent scores. On July 5, 2005, he was certified as a test cosmonaut. SPACEFLIGHT TRAINING: January 29-31, 2005, Artemiev participated in winter survival training with Michael Barratt and Sandra Magnus, NASA astronauts, as a crew commander. Emergency landing of the Soyuz Descent Module was simulated in the Moscow Region forest and lasted for two days. June 2-10, 2006, he took part in water survival training with Yuri Lonchakov and Oleg Skripochka. The Soyuz Descent Module emergency landing to the water was simulated near Sevastopol, Ukraine. January 16-27, 2007, participated in winter survival training with Charles Simonyi from the USA and Sergey Revin in the forest 30 km away from Moscow. November 15-29, 2007, he participated in a 14-day-long test as a part of the MARS-500 Experiment. From March 31 to July 14, 2009, took part in a 105-day-long preparatory experiment for MARS-500. CURRENT STATUS: Since 2011 he is a test cosmonaut of the Roscosmos Cosmonaut Corps. Family: Cosmonaut. Country: Latvia. Flights: Soyuz TMA-12M, Soyuz MS-08. Agency: Korolev bureau. Bibliography: 4452, 5122. 1970 December 28 - . Birth of Oleg Germanovich Artemyev - . Nation: Latvia. Related Persons: Artemyev. Latvian engineer cosmonaut, 2003-on. 2 spaceflights, 366.0 days in space. Flew to orbit on Soyuz TMA-12M (2014), Soyuz MS-08..
2013 September 25 - . 20:58 GMT - . Launch Site: Baikonur. Launch Complex: Baikonur LC1. LV Family: R-7. Launch Vehicle: Soyuz-FG. Soyuz TMA-10M - . Call Sign: Pulsar. Crew: Hopkins, Kotov, Ryazansky. Backup Crew: Artemyev, Skvortsov, Swanson. Payload: Soyuz TMA s/n 710. Mass: 7,200 kg (15,800 lb). Nation: Russia. Program: ISS. Class: Manned. Type: Manned spacecraft. Flight: Soyuz TMA-10M. Spacecraft Bus: Soyuz. Spacecraft: Soyuz TMA. Duration: 166.27 days. Decay Date: 2014-03-11 . USAF Sat Cat: 39263 . COSPAR: 2013-054A. Apogee: 415 km (257 mi). Perigee: 411 km (255 mi). Inclination: 51.65 deg. Period: 92.82 min. Docked with the Poisk module of the ISS 5 hours 46 minutes after launch. Undocked from the Poisk module of the ISS at 00:02 GMT on 11 March, landing in Kazakhstan at 03:24 GMT..
2014 March 25 - . 21:17 GMT - . Launch Site: Baikonur. Launch Complex: Baikonur LC1. LV Family: R-7. Launch Vehicle: Soyuz-FG. Soyuz TMA-12M - . Call Sign: Cliff. Crew: Artemyev, Skvortsov, Swanson. Backup Crew: Samokutyayev, Serova, Wilmore. Payload: Soyuz TMA s/n 712. Mass: 7,200 kg (15,800 lb). Nation: Russia. Program: ISS. Class: Manned. Type: Manned spacecraft. Flight: Soyuz TMA-12M. Spacecraft Bus: Soyuz. Spacecraft: Soyuz TMA. Duration: 169.21 days. Decay Date: 2014-09-11 . USAF Sat Cat: 39622 . COSPAR: 2014-013A. Apogee: 417 km (259 mi). Perigee: 412 km (256 mi). Inclination: 51.65 deg. Period: 92.85 min. The third planned rendezvous burn at 23:48 GMT was cancelled due to a software problem, leaving the spacecraft in a 297 x 333 km x 51.7 deg orbit. Rendezvous with the ISS was rescheduled to 27 March. It maneuvered to a 414 x 425 km orbit on 26 March. Docking with the ISS at the Poisk module was at 23:53 GMT on 27 March. On September 10 at 23:01 GMT Skvortsov, Artemev and Swanson undocked from the Poisk module in Soyuz TMA-12M. The deorbit burn at 01:30 GMT September 11 was followed by module separation at 01:58, atmosphere entry at 02:01, and landing in Kazakhstan at 02:23. 2014 August 18 - . EVA ISS VKD-39 - . Crew: Artemyev, Skvortsov. EVA Duration: 0.22 days. Nation: Russia. Program: ISS. The airlock was depressurized at 13:40 GMT and the hatch opened at 14:02 GMT . At Artemev hand-launched the 1U cubesat Chasqui-1, a joint Peruvian-Russian project. The crew also worked with materials exposure experiments; installed the EXPOSE-R2 experient on Zvezda's URM-D-II boom, and on Poisk retrieved Panel 2 of the Vinoslivost experiment and swapped out the SKK-1-M2 cassette for the new SKK-2-M2; and installed the new BKDO experiment to study the effects of rocket thruster plumes impinging on the station. A Biorisk exposure canister was retrieved from Pirs. The astronauts went back inside to close the Pirs hatch at 19:13 GMT and repressurize the airlock at about 19:16 GMT. 2018 March 21 - . 17:43 GMT - . Launch Site: Baikonur. Launch Complex: Baikonur LC1. LV Family: R-7. Launch Vehicle: Soyuz-FG. Soyuz MS-08 - . Call Sign: Hawaii. Crew: Artemyev, Feustel, Arnold. Backup Crew: Ovchinin, Hague. Return Crew: Artemyev, Feustel, Arnold. Payload: Soyuz 11F732A48 No. 738. Nation: Russia. Program: ISS. Class: Manned. Type: Manned spacecraft. Flight: Soyuz MS-08. Spacecraft Bus: Soyuz. Spacecraft: Soyuz MS. USAF Sat Cat: 43238 . COSPAR: 2018-026A. Apogee: 408 km (253 mi). Perigee: 403 km (250 mi). Inclination: 51.64 deg. Period: 92.68 min. See Soyuz-MS 08. ..
2018 August 15 - . EVA ISS VKD-45 - . Crew: Artemyev, Prokopyev. EVA Duration: 0.32 days. Nation: Russia. Program: ISS. The cosmonauts launched four cubesats and installed the Icarus experiment. Spacewalk fell behind schedule when Icarus failed to seat properly putting the spacewalk 90 minutes behind and calling for an hour extension. The cosmonauts finished the spacewalk by retrieving experiments from the�Pirs�docking compartment�and�Poisk�module.